Percutaneous transluminal renal angioplasty and stenting have revolutionized treatment of renal artery stenoses [1van de Ven PJ, Kaatee R, Beutler JJ, et al. Arterial stenting and balloon angioplasty in ostial atherosclerotic renovascular disease: a randomised trial Lancet 1999; 353: 282-6.]. These procedures are routinely done under fluoroscopic guidance, which can involve substantial radiation exposure. In this proof-of-concept experimental animal study, we demonstrate the feasibility of guiding stent placement by a 10F AcuNav ultrasound catheter (Siemens Medical, Mountain View, CA), which was connected through a SwiftLink cable to a Siemens Sequoia C256 ultrasound system. The AcuNav ultrasound catheter was primarily developed for intracardiac imaging applications, but has also been shown well suitable for transvascular imaging [2Bruce CJ, Packer DL, Seward JB. Transvascular Imaging: Feasibility Study Using a Vector Phased Array Ultrasound Catheter Echocardiography 1999; 16: 425-30.]. The purpose of this report was to introduce and illustrate navigation of renal artery stent placement by transvascular ultrasound imaging. 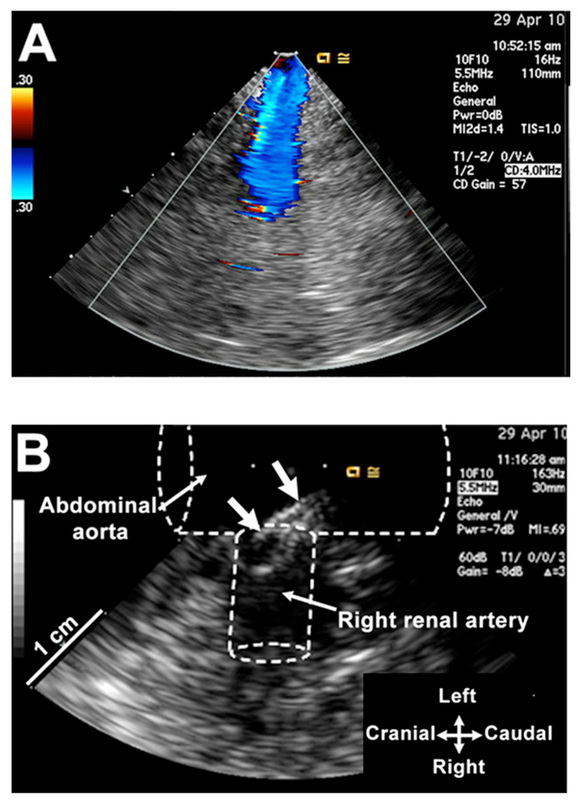 Color Doppler flow ultrasound image of the right renal artery obtained by the ultrasound catheter placed within the abdominal aorta. (B) Tip of the introducer catheter is entering into the right renal artery orifice (thick arrows). The drawing approximates the aortic and renal artery anatomy. A balloon catheter with a coil on its tip has been placed into the right renal artery (small arrows) via the introducer catheter whose tip was subsequently pulled back (thick arrow). (B) The balloon catheter was inflated to deploy the coil, and after deflation pulled back from the renal artery lumen. The ultrasound scan shows reflections (arrows) from the coil. Postmortem photograph showing copper coils placed within right and left renal artery lumens. The insert is a close-up view of the coil inside the right renal artery just after dissecting its orifice. both catheters, leaving the expanded coil deployed in the renal artery wall Fig. (2B ). We repeated the procedure in the contralateral renal artery. 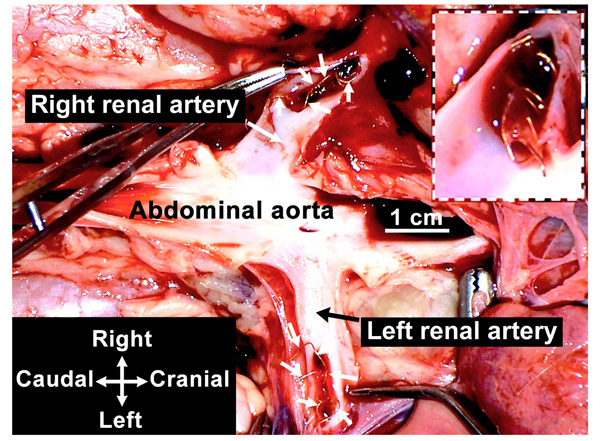 At the end of the surgery, postmortem dissections documented successful coil placement inside each renal artery Fig. (3 ). To our knowledge, this is the first transvascular ultrasound-guided placement of a renal artery stent by using an intracardiac ultrasound probe. We thank Naomi Gades, DVM, and Ronald Marler, DVM, PhD, for helpful discussions, Danielle Wright for secretarial work, and Ronald Buono, RDCS, for technical assistance. We are also grateful to Siemens Medical Solutions for loan of their SwiftLink cable for connection of our AcuNav catheter to a Siemens Sequoia C256 ultrasound system. Dr. Belohlavek was supported by NIH Grant EB009111. van de Ven PJ, Kaatee R, Beutler JJ, et al. Arterial stenting and balloon angioplasty in ostial atherosclerotic renovascular disease: a randomised trial Lancet 1999; 353: 282-6. Bruce CJ, Packer DL, Seward JB. 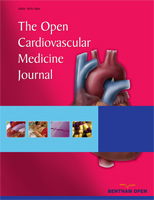 Transvascular Imaging: Feasibility Study Using a Vector Phased Array Ultrasound Catheter Echocardiography 1999; 16: 425-30. Lerman LO, Schwartz RS, Grande JP, et al. Noninvasive evaluation of a novel swine model of renal artery stenosis J Am Soc Nephrol 1999; 10: 1455-65.